Russian knapweed grows up to three feet tall with considerably branched stems. Leaves up to six inches long and one and a half inches wide grow near the base of the plant and become smaller toward the top. The small half-inch flower heads on the branch tips may be white, pink, or lavender-blue. The stems die back after flowering in the summer and new shoots are generated in spring. Russian knapweed multiplies by sending out shoots underground. It also produces small quantities of seeds, which can live in the soil for two to three years, allowing the plant to take hold in new areas. 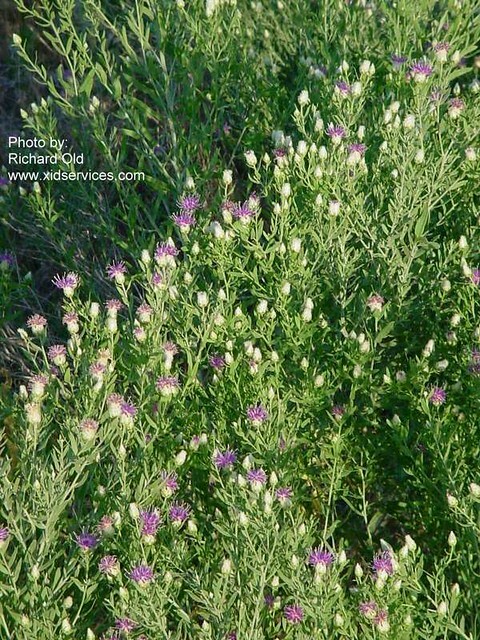 Knapweed is thought to inhibit the growth of neighboring plants by releasing allelochemicals into the soil. It is also toxic to horses if they eat sufficient quantities. Under most circumstances livestock avoid grazing Russian knapweed because of its bitter taste. Controlling Russian knapweed can be difficult. Removing the above-ground growth only encourages the plant to send out new underground shoots. Hand pulling is very difficult and doesn’t remove enough of the root system to prevent it sending out new shoots. The sap of Russian knapweed may irritate the skin so it is recommended to wear gloves when handling it. Mowing will reduce the plant’s seed production if done before the seeds are set.